Steven just returned from a one week tour of Germany to launch the new German edition of The Barbecue Bible. (Yes, that’s what it’s called.) The whirlwind tour took Steven from Frankfurt to Cologne to Bonn to Munich to Hamburg to Berlin. Here Steven poses for Germany’s biggest newspaper, Bild Am Sonntag in the famous Gendarmenmarkt in what was formerly East Berlin. March in Germany isn’t exactly what you call grilling weather–in fact, Steven kept his overcoat on most of the journey. 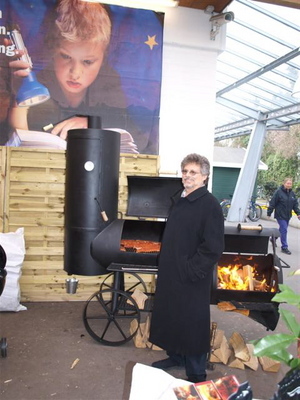 But this German-made Texas-style smoker (www.rumobbq.de) helped ward off the cold. So did visits from new friends from the German Barbecue Society. The trip was pretty intense, but Steven found time to do a little sightseeing. 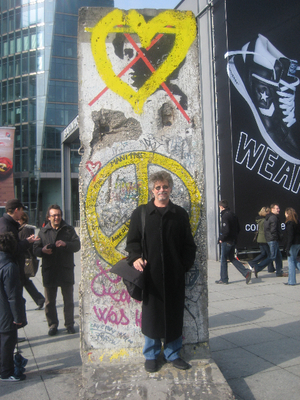 Here he is in front of a piece of the Berlin wall. 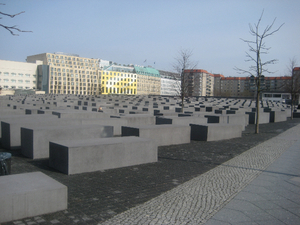 And at the Holocaust Memorial near the Brandenburg Gate. 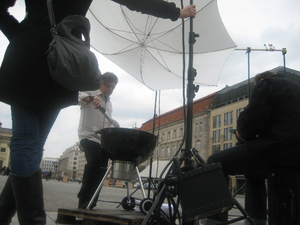 Das Barbecue Bible is published by Ullmann and is available at bookstores everywhere in Germany.